Last night I carefully planned my schedule for today. In order to catch the train to Piegaro to see Colleen and Tom Simpson from Seattle I’d need to be at the station in Viterbo at 4:00 this afternoon. 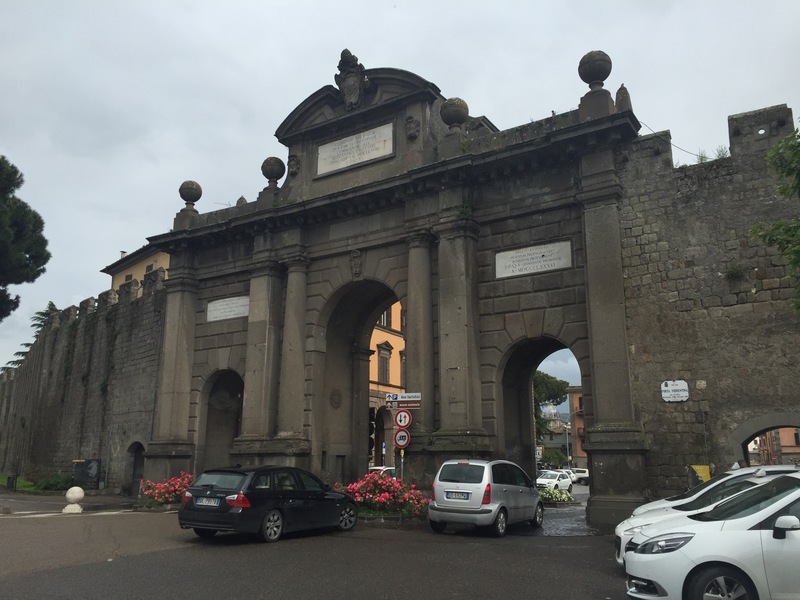 At my walking rate of 4km an hour, factoring in breaks, I’d need to leave Bolsena at about 7:30 a.m. So I slipped out of bed at 6:30, was in the cafe at 7:00 for breakfast and was out the cafe door at 7:30. Just in time to walk eight solid hours with no diversions so I could catch the train. 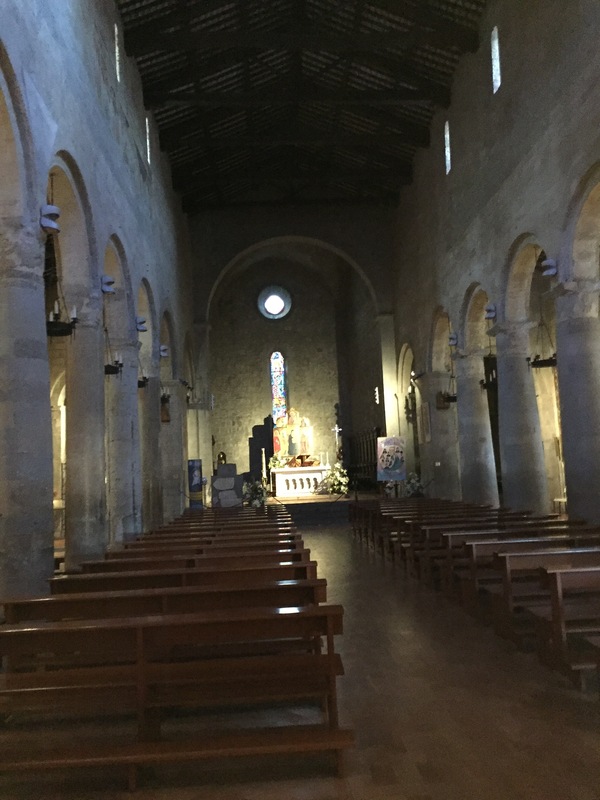 As I headed out of Bolsena I thought I’d poke my head into the famous church where a miracle of communion had occurred. 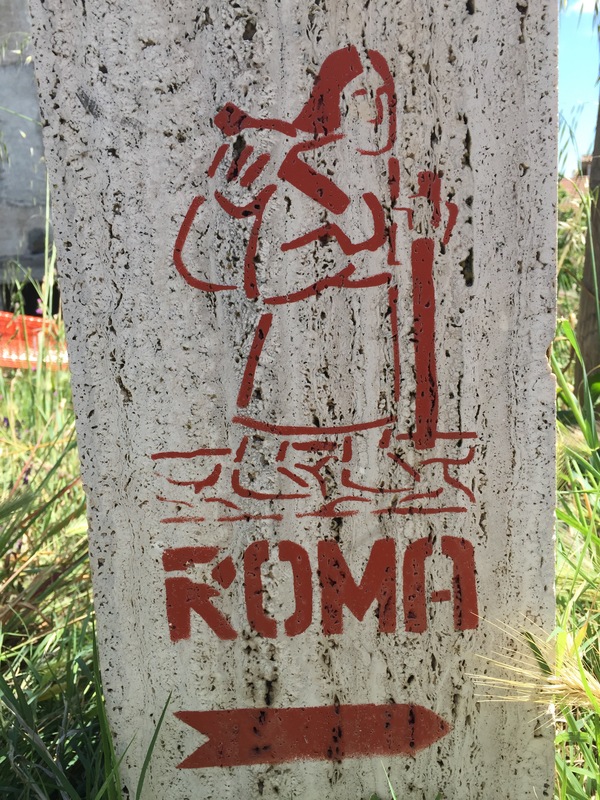 I walked across the piazza toward the church and a nun loudly shouted at me in Italian, “No, the Via Francigena is that way.” She pointed to a street across the piazza. “May I see the church before I go?” I asked in Italian. “Oh. There’s a mass in five minutes. This is the church of the miracle of holy communion.” And with that she ducked into a side chapel of the church where music had begun to play. The Via Francigena is the other way, but I was glad to have a quiet moment in this beautiful church before beginning the day’s walk. Her words were a reminder to me that today I would need to follow the guidebook’s directions very carefully. Any diversion could add distance and time to my walk. I’d also need to keep a steady and quick pace all through the day. The walk started out on the auto road, then a few km later headed for the hills, where it stayed all the way to Montefiascone. With the exception of one sketchy creek crossing the morning was simple and quick. I followed the signs as the guidebook instructed, but somehow ended up at the “if you have time you should go” place listed in the directions. 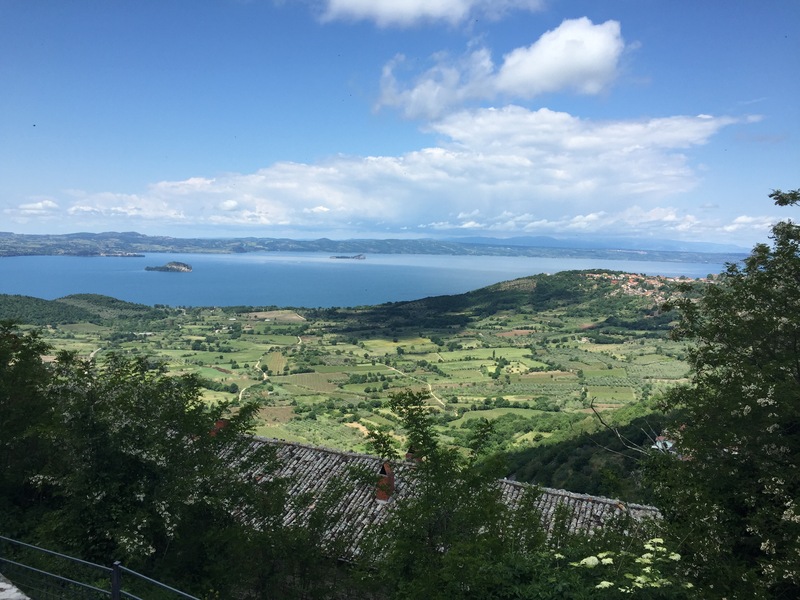 Fortunately, the diversion was the Rocca di Papi, a hill above Montefiascone with spectacular views of the area, including the entirety of Lake Bolsena, as far north as the castle at Radicofani and west all the way to the sea. And the weather was perfect to see it all. 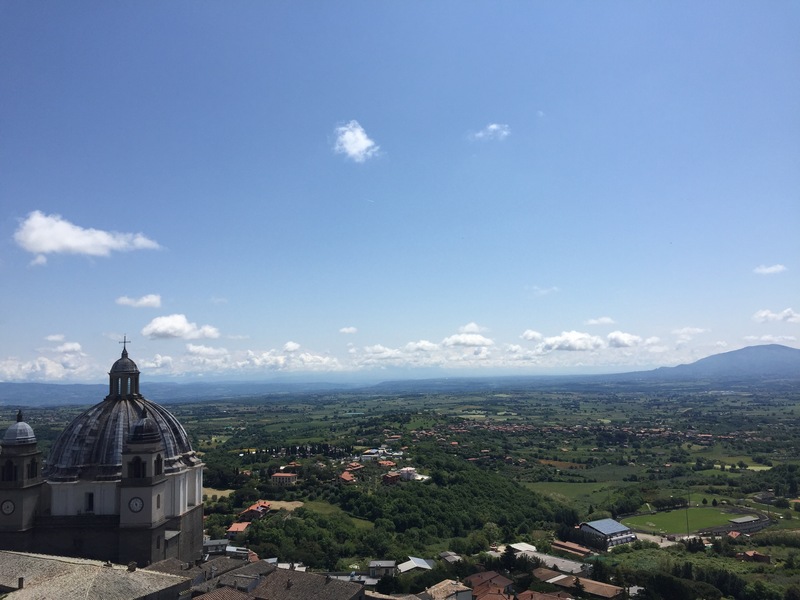 This picture cannot do justice to the amazing views from Rocca di Papi. The excursion up to the Rocca cost me an extra 30 minutes, so as I walked briskly ahead, I started to calculate the remaining distance against the remaining time. Thank heavens the road was a good one. As it happens, the Romans had built it nearly 2000 years ago. Their roads were built to last, with deep foundations and careful engineering to ensure a long life. The strip between Montefiascone and Viterbo is the original Via Cassia that essentially I’ve been following for three weeks. They now call it the Via Cassia Antica. As I walked it I watched for grooves in the stones, sure signs of countless carts carrying goods back and forth to the capital of the empire. 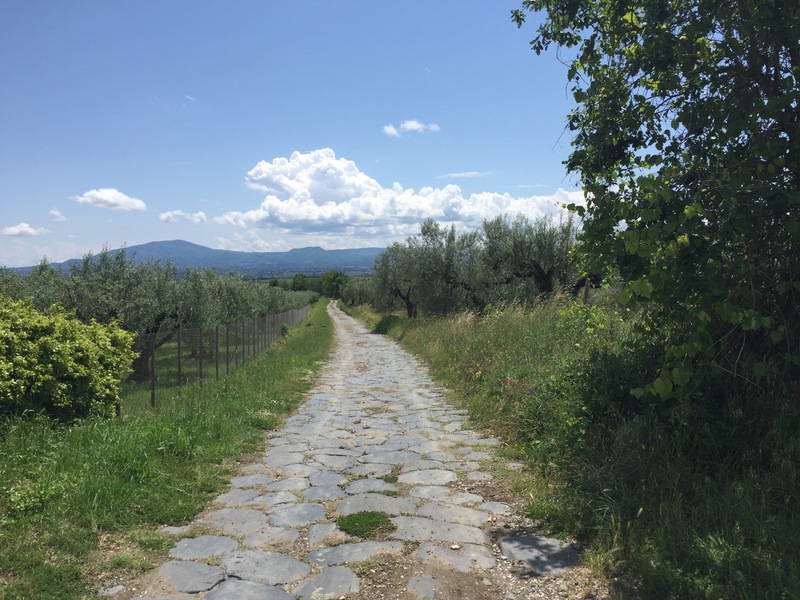 Once off the Roman road the last kilometers seemed interminable, as usually is the case with last kilometers. I arrived in town, snapped a couple of photos, and found a bar with a stamp for my credential. After finding the train station I had an hour left over. 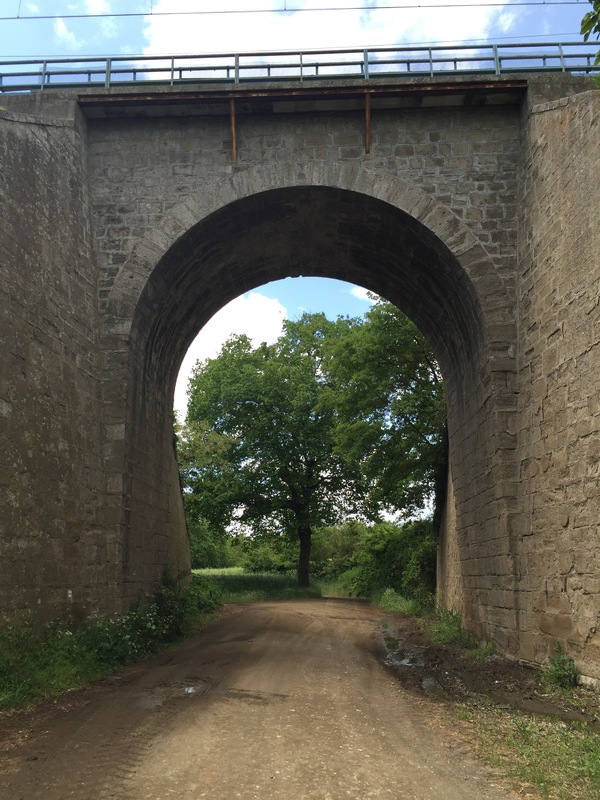 Credit in part should go to the workers and planners who built the road so many years ago.